I’m an expert conflict-avoider. How about you? I grew up in a household where there was a lot of yelling and rage and verbal abuse. As a result, everything within me tries desperately to avoid anything in my marriage that could result in tension, raised voices, or anything remotely resembling conflict. 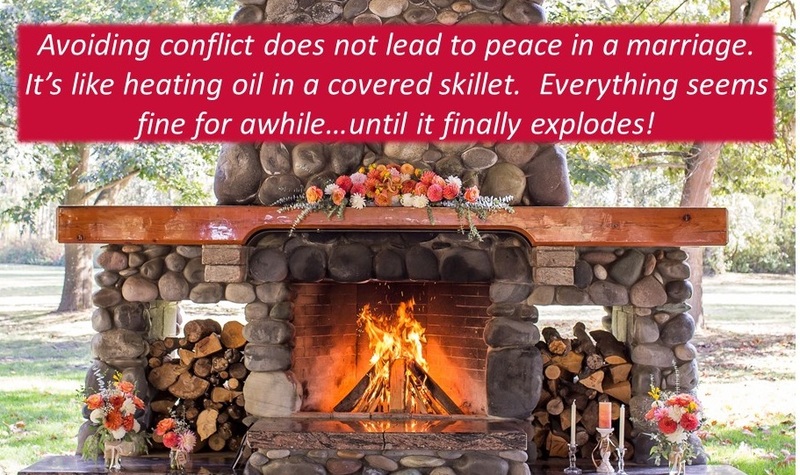 However, avoiding conflict is a recipe for disaster in a marriage. I learned that the hard way in my first marriage, which failed. Here’s the thing. If you don’t address the things that are really bothering you about your husband or your marriage, a seed of bitterness is planted in your heart. That seed slowly takes root and grows, and after months and years go by, you will most likely grow to despise your husband and want a divorce! Not good. So, let’s commit to respectfully, lovingly, and diligently address the things that are bothering us within our marriages. Hebrews 12:15 warns us not to let “any bitter root grow up among you to cause trouble…” So, ask God to give you the courage to gently and respectfully discuss your concerns with your husband. Ask God to give you the courage to express your needs and desires to your husband. Do not become invisible. When you start stuffing your feelings and immediately cave in during disagreements, toxic resentment will start to grow inside you. Don’t let that happen!